Mindika Moments: Monday Moments - Part II...finally a cooking giveaway! Monday Moments - Part II...finally a cooking giveaway! Let's move on to the next giveaway! One that I'm particularly excited about. When I'm asked what my favorite cook book is, I always have the same answer. I don't really have a favorite cookbook. I have over 40+ cookbooks and have favorite recipes in all of them, but my one consistently favorite source for good recipes and cooking inspiration would be my Cuisine at Home magazines. This magazine is so much more than just a recipe source. It's full of techniques, cooking tips, and ingredient information and background. It comes bi-monthly and I find myself reading it over and over again. 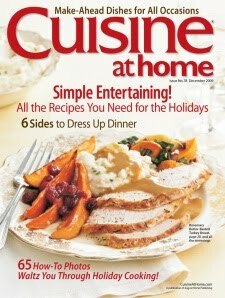 So...with no further delay...I am giving away a 1 year subscription to Cuisine at Home Magazine. Beginning January 2010. Courtesy, yours truly! Here's what you have to do! First of all you leave a comment on this post letting me know you why you want this magazine! Second...if you want to be entered more than once, you can share my site with your friends on facebook or tweet about this site. This will have to be on your honor, and I trust you. So just mention in your comments that you did one or both and I will enter your name in the drawing more than once. The contest will be open until Sunday, November 29th at midnight. The winner will be announced on Monday, November 30th. I want this one bad! I looked at Chellese's Holiday issue and was in a frenzy with all the yummy recipes! Plus if its where you get some of your ideas it must be good! I'll facebook about it too. This is the first time I've heard of Cuisine at Home, but a bi-monthly magazine full of techniques, cooking tips, and ingredient information sounds fabulous! I have never heard of this one but I am so sad that Kraft is not doing there free magazine anymore. Looks great. I've never heard of this magazine.. but I'm addicted to cooking magazines so I bet this one would be great! I facbooked about your site and I don't tweet so, that is just two for me. Never hear of it either, but LOVE cooking magazines! And I just posted it on facebook. Give me a double shot! My mom gave me a subscription a few years ago. She must have been trying to inspire me. The Lasagna Soup I made for book club came from Cuisine At Home. I want to win! Yea!! I need to learn :) Pick me! Pick Me! I'd love a 1 yr subscription! Looks yummy! I would love to have this magazine! I love cook books and cooking magazines and have never had a subscription to this one but it looks great. P.S. I love your blog. I check it multiple times a week and have made a couple of your recipes which my family has loved. Thanks for doing what you do! I love it. Look at you go! You're going to be on Food Network before we know it! Can't wait to see you and youre adorable family! I'd love this prize. My favorite cookbook is the America's Test Kitchen family cookbook. It's full of tips and things to learn, I can't live without it! I'd love it, because I'd give the subscription as a gift to my daughter, who has gotten into catering this past year.